With the Kidde Key Safe Auto vehicle key lock box for cars and trucks you can keep larger keys and remote transmitters securely at your car or truck. This lock box for vehicle keys provides secure access for employees or for convenience when going on recreational outings. This AccessPoint 1266 heavy duty yet portable locking key holder is made with the same durable construction that car dealers have relied upon for years. The Key Safe Pro Auto has a mechanical push-button lock -- which needs no batteries -- opens easily using a numeric code you choose yourself and can change any time you want. 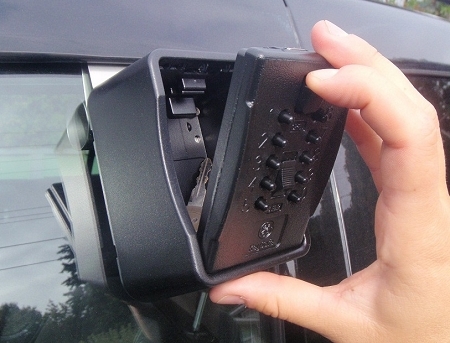 The Stor-A-Key Big Box for Cars & Trucks has an access door that is attached with a flexible "hinge" enabling the lock box to be opened and the key retrieved with one hand. The stainless steel hanger slips over a window and is secured when the window is rolled up and the back of the body is cushioned to protect surfaces. 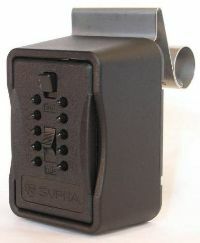 A protective cover is included with the vehicle lock box. Body size: 4-7/8"h x 3-1/2"w x 2-1/2"d.
Interior size: 3-5/8"h x 2-3/8"w x 1-1/2"d.
Save on 6: When you buy 6 or more of the Key Safe Pro Auto's, your price is $49.95 ea.